I moved to San Francisco in 1999 and lived all around the Bay Area including in Oakland and Bolinas for the following 15 years. I worked with Zaccho Dance Theatre for many years in Bayview Hunters Point and was an artist in residence, then Multimedia Artist, then Senior Design Developer at the Exploratorium during my 10+ years at that institution. My deep connection to the environment was developed in San Francisco and I spent countless hours on the water’s edge documenting and learning from the birds and wildlife. I am deeply interested in the intersections of the natural world and built environment. In that spirit, I would be thrilled to develop a public work for the Waterfront Plaza that could illustrate how vibrant these transitional spaces are. Pictured above is an project developed for a ocean specific program at the Headlands Center for the Arts in Marin. It is a musical instrument powered by the force of ocean waves. It’s an example of my interest in working in these liminal spaces. 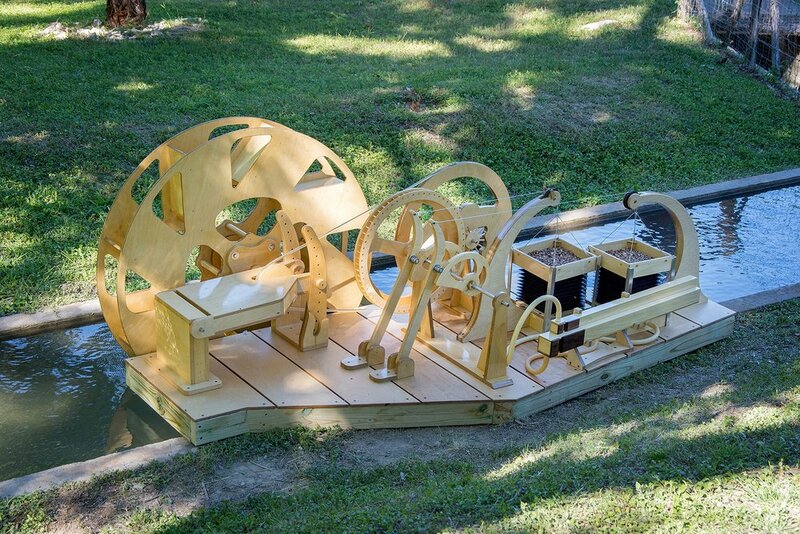 To the right and below are images of a private commission in Texas that uses diverted river water to periodically inflate a pair of bellows that exhale through hand-built organ pipes. It is a memorial to those who lost their lives when the same river flooded in 1998. Pictured below is a another kinetic work that could also be used as a maquette for a larger scale steel or composite sculpture on or near the shore. The form echoes the landing poses of Great Blue Herons and Great Egrets found in the area. It speaks to arrival and departure which seems fitting for a ferry terminal. All of the works picture are fabricated largely from wood. It is a material I am deeply familiar with and is a medium in which I sketch and develop prototypes. I understand the need to build in materials suited for the marine environment and am prepared to design accordingly. My strength is responding well to the demands of a particular project and site. I have access to a team with expertise in large scale fabrication (steel, aluminum, composites, etc…), CNC machining and milling, engineering, and also complex public art installations (renowned public artist Ned Khan has agreed to be a technical advisor). The work to the right and below is of a much smaller scale but I include it to illustrate the scope of my imagination. Pictured are awards that I designed and built that contain a bubble of air. That air was retrieved from bubbles in glacial ice that were trapped in Greenland 12,000 years ago. The air in the awards has never touched modern air and was extracted in a paleoclimatologist’s lab at Oregon State University for these awards that were presented by C40 Cities, a Bloomberg Philanthropies group, to an international group of mayors fighting climate change. Pictured below is a mural built in 2011 for Terminal 2 at San Francisco International Airport. This was a SFAC commission. It is 26 feet long and both the central bird and the benches are xylophones that are tuned to the notes of birdsong. My time at the Exploratorium taught me about the things to be mindful of when designing work for public use. Both with regard to durability and maintenance, and generating a sense of wonder that creates greater engagement with visitors. The work below was a sound installation at Montalvo Art Center that changed the sound environment whenever a park visitor sat in the chair and began to rock. Their were sound vessels (speakers) tucked into nearby trees that responded wirelessly to the chair’s motion. I include the work below to show an interactive work that included both sound and lighting as it created the illusion of water on the wall as viewers interacted with it. I’m mindful of the prompt about using reflective materials to integrate the surrounding environment into possible works on the Plaza. In summary, the Treasure Island projects are exactly the sort of opportunity I want to take on because they align perfectly with my intention to develop and build memorable and lasting public art as a focus of my art practice.